We examine the impact of coastal wind turbines on coastal tourism and recreation for residents of the northern CAMA counties in North Carolina. A combination of telephone and web survey data are used to assess the impact of coastal wind farms on trip behavior and site choice. Most of the respondents to our telephone survey claim to support offshore wind energy development, and independent survey data suggest that the observed levels of support may be indicative of the broader population in this region. 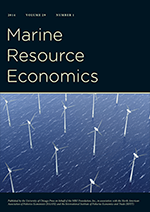 Overall, we find very little impact of coastal wind turbines on aggregate recreational visitation; loss in consumer surplus associated with wide spread wind development in the coastal zone is insignificant at $17 (or about 1.5%). Results suggest that NC coastal residents are averse to wind farms in the near-shore zone; average compensating variation for wind farms one mile from the shore is estimated at $55 per household. On average, we find no evidence of aversion to wind farms 4 miles out in the ocean, or for wind farms located in coastal estuaries. For all wind farm scenarios, we find evidence of preference heterogeneity– some respondents find this appealing while others find it aversive.